One of a kind vintage bohemian clutch decorated with tassels, this boho clutch is made with vintage textile. This gorgeous one of a kind clutch purse is handmade with love in Thailand. 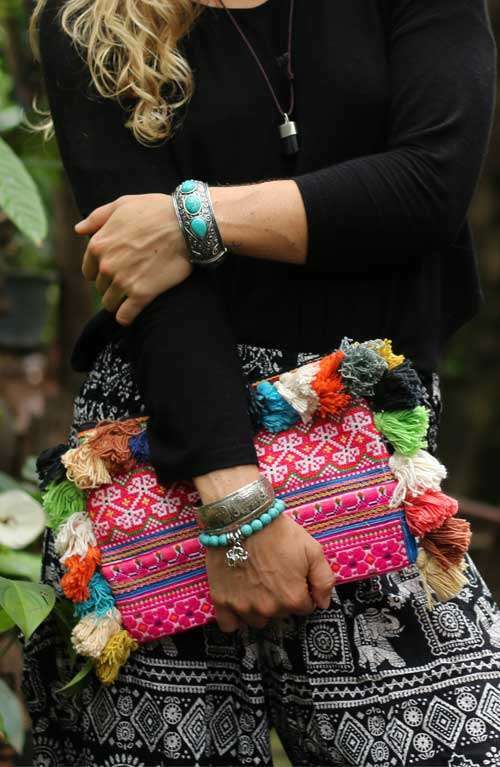 The bohemian purse features unique vintage textile from the Hmong Hill Tribes of Northern Thailand. This beautiful embroidered clutch is decorated with crazy colorful tassels and has a zipper opening. Great clutch bag for all occasions. Please note this bag is made with vintage fabrics making each bag unique and one of a kind! You will receive a similar bag to the one pictured.